Fly fishing in Montana is what we live for. Our outfitter and Montana fly fishing guides have made it their job to give our anglers the best guided fly fishing experience in the Big Sky State. From our home base in Bozeman, MT, anglers are able to enjoy blue ribbon fly fishing on famous waters like the Yellowstone River, Missouri River, Madison River, Gallatin River, the Paradise Valley Spring Creeks, Yellowstone National Park, and many other waters more off the beaten path. We pride ourselves on showing anglers their best Montana fly fishing experience yet, and work hard, every day to make sure it happens. We invite you to book your next guided fly fishing trip in Montana with the Montana Angling Company and learn what distinguishes us as a Montana fly fishing outfitter. Our outfitter personally handles all of our Montana fly fishing trip bookings, so you can count on his experience from the moment you first contact us. Fly fishing has taken him all over the world, from Montana to Chile and just about everywhere in between, and his experience outfitting, guiding, managing lodging, and working in fly shops gives him a unique perspective on what makes a great Montana fly fishing trip and an understanding that personal service for anglers is what matters most. From fishing, to guides, to lodging, to dining, we treat every trip as custom and work with our anglers to build their ultimate Montana fly fishing trip. So whether you are booking a day trip in Bozeman, or a multi-day fishing package across many of our rivers, know when you book with the Montana Angling Company, you will receive the personal service all anglers deserve. We are lucky in Montana to have such an abundance of great fly fishing. Through our custom fly fishing outfitting, we extend the opportunity for all of our anglers to access this unmatched variety. From the famous blue ribbon waters of the Yellowstone, Madison, and Missouri Rivers, to the endless miles of fly fishing in Yellowstone Park, to numerous rivers more off the beaten path, and private water access to spring creeks and trophy trout lakes, we have something to offer for every angler. 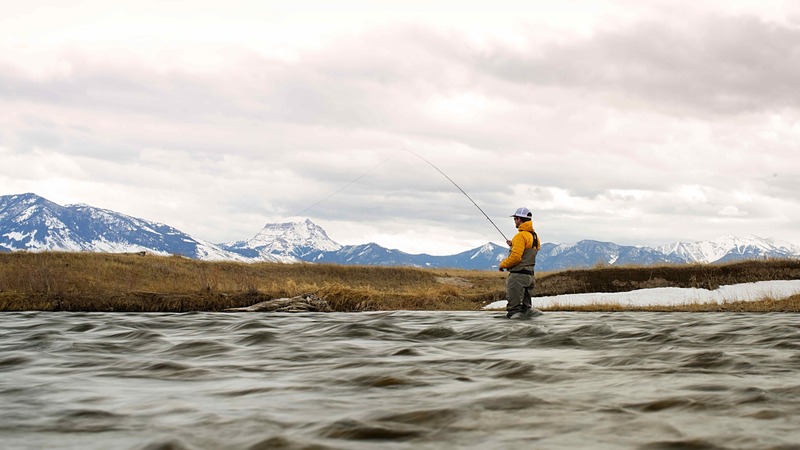 From our home base of Bozeman, MT we have several lifetimes worth of blue ribbon fly fishing, and our network of local guides across the state allows anglers to experience truly unmatched variety on their trip with the Montana Angling Company. At the core of the Montana Angling Company is the hardest working and truly experienced guide staff around. Our Montana fly fishing guides are all consummate professionals with decades of combined experience on all of our blue ribbon waters. Quality of guiding largely impacts the quality of any Montana fly fishing trip, so we only work with the best guides we can trust and depend on to work hard for all of our anglers and make sure every trip is safe, fishy, and fun. Our anglers can count on our fly fishing guides to have the experience to make their next Montana fly fishing trip truly great. Fly fishing is a sport that, as anglers, opens the door to a lifetime of learning about fishing, wildlife, wild places, local culture, history, the great outdoors, conservation, and ourselves. As a Montana fly fishing outfitter we feel we have a responsibility to provide our anglers with new learning and educational opportunities on every trip. By emphasizing this aspect of our sport, we are able to provide something of value for anglers of every skill level and background. We consider ourselves to be teachers as much as we are fly fishing guides and our anglers are able to enjoy the benefits of both on their fly fishing trips with the Montana Angling Company.